All students are invited to stop by our table in the Mall area on Wednesday, February 20 from 10:00 am – 12:00 pm and sign “Thank You” cards and send shout-outs to our donors. T-shirts (first 200) and other freebies will be given out to participating students. The Annual Giving office will join over 100 educational institutions worldwide to participate in Student Engagement and Philanthropy Month. The purpose of the day is to say thank you to the many alumni, friends, faculty, staff and students who support the University through private gifts. 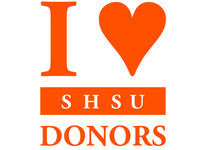 For more information, contact Meggan Thompson, Assistant Director of Annual Giving at 936-294-2401 or met013@shsu.edu.